Dental veneers are the best method of creating a beautiful smile even if you have crooked, stained, damaged teeth or misshapen teeth. A veneer is a thin layer of porcelain that will bond to your tooth to give it a whole new appearance. Now veneers can be made thinner than ever to make it easier to change the structure of your teeth, giving a more natural and healthy look. They will improve the appearance of the teeth that you have chipped, misaligned or discoloured. 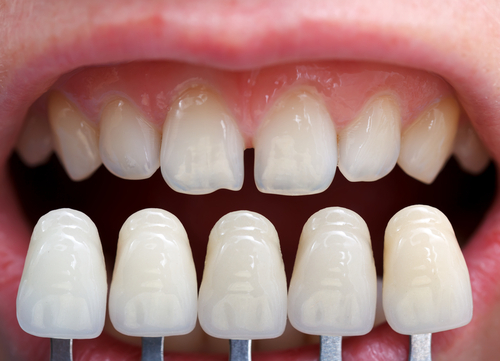 A veneer can change the size and the shape of teeth and their colour. You may have teeth that are badly stained and cannot be whitened; the perfect solution here would be dental veneers. Additionally, veneers can be used to cover up small, unsightly looking gaps between teeth. here are two main materials used to make dental veneers. Porcelain, composite bonding. Porcelain veneers last longer than the latter. These will last at least 10 years, after which they may need to be replaced. Porcelain veneers are the most popular type although some patients may choose composite veneers (composite bonding) due to the cost as porcelain veneers are a little more expensive than composite veneers. Composite is less durable over time and are more costly than porcelain veneers, therefore if you have a composite veneer, you may need to replace it more frequently than a porcelain veneer. An advantage with porcelain veneers is that they will give a more natural appearance than a composite bonding. However, composite bonding is more suitable to remove a small chip in a tooth. The Dentist will thoroughly examine and prepare your teeth for reshaping. You will be given a local anaesthetic. At this visit the dentist using special dental wax will make an impression of you teeth and this mould will be used to make the final veneers. It may take a few weeks to produce the permanent veneers; until they are ready, the dentist will fit temporary veneers. Once the final veneers are ready we will arrange for you to visit for the final fitting. The dentist will fit the veneers, checking the correct positioning and overall look of your smile. If you and the dentist are happy with final outcome, they will be removed in order to finally clean the teeth before the permanent fixing. The dentist uses a special dental cement to stick the veneers and a curing light is used to stimulate the cement to create a firm attachment between the tooth and the veneer. Once this has been completed the dentist will give the teeth a final polish. The veneers treatment can be carried out in two visits to the dental practice. We are open late nights and Saturdays for your convenience. Your treatments can be done in two consecutive weekends. Fill out our online appointment form or call 01606 44725 for more information. Our experienced dentists in Cheshire are always happy to help you.